These tall tales have been lifted from our main guitar pages which contain much more info and and many photos. This was my first guitar. Actually it was my Dad's guitar. I believe he bought it at Ray Hamerton Music in Winnipeg in the early '50s. Hamerton's used to send out an annual catalogue of their musical instruments and supplies and I remember spending many hours poring over this. Even though my Mom and Dad had regular jam sessions throughout the '50s, he never really played it much, preferring to play the trumpet while my Mom played piano. I started taking piano lessons while in Grade V or VI and the whole process was largely one of drudgery. But I remember that I used to open the fibre case that housed the shiny archtop and marvelled at its beauty - the shape, the smell and the feel of it. I had been committed to the discipline of piano lessons, however -- and often fell under the wrath of my frustrated piano teacher when I showed up without having practiced the assigned lessons. THEN Elvis and Sun Records appeared on the scene. And Dad came home excited one day after hearing a song on the car radio that featured one of the few riffs he knew on guitar. The song turned out to be Johnny Cash's I Walk The Line, with the whole song made up around Luther Perkin's guitar runs between C, F and G. That was it. Boring scales and kiddie tunes on the piano didn't stand a chance when pitted against the exciting sounds of this new thing called rock 'n' roll - and especially the guitar sounds coming out of Memphis on Sun records. I was totally captivated. Countless hours were spent roaming the radio dial to pick up each week's new rockabilly and R&B barrage of hits that emanated from the Southland. My Uncle Don, had played guitar with my Mom and their brother, Bill, in the family band -- The Campbell-Christie Orchestra -- back in the '30s. They were just young kids but they joined forces with a couple of neighbor buddies and played quite a number of dances at halls and barns around the area (guitar, piano, autoharp, trumpet, fiddle, accordian, etc.) When Uncle Don saw that I was more than a little obsessed with the instrument, he showed me a few more chords and how to play a few folk songs. I soon found that mastering this instrument was no easy task. It was hard to tune and the strings were so high above the fretboard that I could barely press them down. My fingers soon became raw and blistered and often bled, but I persisted. It was around this time that I got my first record player and LPs for Christmas. Previous to this all we had to play records on was a 78 rpm turntable plugged into our huge floor model Westinghouse radio. The first 78s I had bought for this old machine were a package of 50 Top Hits of the Day (by imitators) with three hits per side, and then a flood of REAL records: Elvis and the Blue Moon Boys, Fats Domino, Jack Scott, Johnny Cash, Little Richard, etc. But now with my new RCA multi-speed portable record player I could at last buy LPs and those cool 45s. I could also slow the records down to half speed so that I could figure out what Scotty Moore, Carl Perkins, Luther Perkins, Duane Eddy, Les Bennetts (Lonnie Donegan's skiffle group), Chet Atkins, et al, were actually doing on those great records. Yahoo! A hot summer day in Strathclair, 1960. I took a walk over to the hardware store that Dad managed (a new career to offset last year's disaster when our crop was hailed out) to take a lunch break from my summer painting job. A parcel from Simpson-Sears mail order had just been delivered -- my first electric guitar . . . and amp: a Sears Silvertone made by Harmony. It was a gift from my Nannie Campbell - the first of numerous guitars she would help me acquire. Sitting in the family 1960 blue Pontiac in the lane behind the store, I tore open the box. It was a beaut! . . . shiny black finish with metallic speckles and white trim. And that neck and fingerboard! The strings lay almost against the frets . . . no effort to play. I remember that the first thing I played on it was a low string "Honky Tonk" blues riff I had learned from a kid at Air Cadet Camp in St. Jean, Quebec, earlier that summer. This is day I will never forget . . . I still have the box it came in. Now I could join in the family jams and be heard. At about this time my mom and uncle were talking about getting together with members of the Christie family for a Campbell-Christie Orchesta reunion. This reunion in the Municipal Hall where they had played many times back in the '30s, turned out to be my first appearance on stage with a guitar. Now I was ready to ditch those piano lessons. I've learned since that many other guitarists who went on to major careers also had a similar experience with this model. 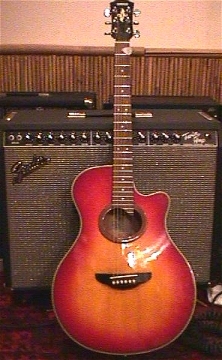 It is a popular vintage guitar now in rock and country videos . . . Neil Young . . . Bryan Adams . . . and many others have paid tribute to it on stage and in interviews. I remember once a few years after when my Gretsch had been stolen, my rhythm player offered to lend me his Strat for a major show . . . but I just couldn't get used to the feel of it and decided to use my old friend, Silvertone, instead. This was the guitar I took with me to Brandon College in the fall of '61 . . . a real companion for a homesick farm kid away from home for the first time. My Silvertone guitar was a constant companion during my first year at Brandon College, so word started to get around that I was some kind of guitar player. Gradually I started jamming with other musicians and bands: folk, jazz, rock, country, etc. One of the bands had a TV show, but had experienced a bit of a breakup. A classmate in the college dorm, fiddler Barry Forman, had kept the rights to the band name - the Country Gentlemen - as well as the contracts that went with it. Before long, Barry and I were rushing from morning classes every day to reach the CKX-TV studios in time for a daily TV noon show. [See The Country Gentlemen Years] I was expecting to play rhythm guitar on this largely unrehearsed show but on the first day found myself doing lead guitar solos. It was time for a more professional guitar. Barry's mentor and great supporter of local musicians back in his hometown of Rivers was Alex Whyte. Mr. Whyte offered to order a Gretsch guitar -- wholesale -- and before long I was the proud owner of an orange, double cut-away, Chet Atkins model, Gretsch Nashville -- paid for again by my greatest supporter: my grandmother, Katie Campbell. This soon led to a very busy and confusing schedule as I my college classes took a back seat to my rehearsals and playing with an endless variety of bands: Co-Op Neighbour Nights on TV and in person, Flamingo Jazz Combo, Blue Angels (4 hours of rock lead guitar each night), the Shadows and Dovermen rock bands, road tours, and freelancing for a multitude of other gigs around Manitoba. [See The College Years 1961-1965] The Gretsch proved to be a great guitar for many different styles of music. By this time I had upgraded my first Sears amp to a much larger Harmony amp, but my dream was to save enough money to buy one of the new Fender Twin Reverbs. It seemed that the only place the red-haired guy with the orange Gretsch guitar didn't turn up at was the college classroom. When not playing I hung out at the Brandon Roller Rink where the owner brought in a constant stream of touring bands from the States: Ventures, Conway Twitty, Dorsey Burnett, Johnny Burnett, Jimmie Gilmer and the Fireballs, black blues bands, etc. I had the satisfaction of seeing that none of the touring or local musicians I saw had a guitar like mine. The closest thing to it was the thick single cutaway 6120 red Gretsch used by Winnipeg's Randy Bachman of Chad Allan and the Reflections. This was probably my favourite band of the time. Randy used the playback/monitor head of a reel-to-reel tape recorder to get a great echo delay sound which was so vital in achieving their English Shadows instrumentals. The band played Brandon regularly and we got to know them all quite well. By this time I had acquired many wholesale musical catalogues through my Dad's hardware business and Randy had even asked about getting a new Gretsch wholesale. This association with Winnipeg musicians proved to be quite beneficial in many ways in years to come and when we started to tour ourselves. [See The Early Rockin' Years]. In 1965, my ruddy, six-stringed buddy and I were separated under disastrous circumstances. It happened after a freelancing gig I had played with a pickup band in McCreary Hall. The band leader/driver was invited to a small party after the dance so the rest of the band had to go along, reluctantly leaving our gear in a not-very-secure old station wagon. We were soon on our way home however, stopping at Neepawa to drop off our bass player. It was only then we discovered that all our gear had been taken from the back of the wagon . . . including my Gretsch and stage clothes. We reported the theft to the RCMP, but I didn't hold much hope that I would ever see my guitar again. I was prepared to use my old Silvertone for a long time to come when my parents and ever-understanding grandmother came to the rescue. We made some rush calls to music wholesalers. There was no replacement Nashville in stock . . . only a Country Club which I ordered with Bigsby. At the same time we came across a special offered by the Fender wholesaler on the West Coast: a Fender Telecaster in a beautiful custom colour - charcoal green. Soon I was alternating between Gretsch and Fender on stage. I had pretty much given my Chet Atkins model Gretsch up for lost when an amazing turn of events occurred. I received word from Randy Bachman that he had seen a guitar, which he was pretty sure might be mine, in a pawn shop on Winnipeg's Main Street. I passed the tip along to the Mounties whom I had contacted originally and waited for the best. The day this news came in was made even more memorable by the events of the same evening. The Belfast rock group, Them, were booked into Danceland at Clear Lake resort. I stood in front of the low stage for their whole show. Their performance consisted mainly of facing their amps -- coaxing controlled feedback and distortion from their guitars. It was the first time I had seen this done on stage and it was a bit of an inspiration. Van Morrison left the group to pursue a very successful solo career soon after this. A few days later I had a call from the McCreary RCMP attachment informing me that they had retrieved my guitar, but I would have to come over to make an identification before claiming it. They had tracked the thief to Amaranth where they had found my suede stage vest stuffed into his stove . . . but I never did get my blue hipster bell bottom pants back. Suddenly though, my guitar collection had grown considerably. www.hillmanweb.com/guitars/g05.html The temporary loss of my Gretsch ushered in a Fender era. I previously had used my dad's Marshall Wells Hardware business letterhead to obtain quite a number of wholesale catalogues from music distributors. I had ordered a number of Fender ampfliers, but had always been fascinated by the Telecaster. Years earlier I had briefly played one backstage at a Johnny Cash show when I had an impromptu lesson from the originator of the famous Tennessee Two muted "chunk chunk" sound that they used on their Sun and Columbia recordings. While other fans were milling around the "man in black," I was huddled on the side of the stage where Luther Perkins patiently coached me in his unique style while I nervously fingered his guitar. It was quite a thrill at the time and the experience had obviously left an impression. My ensuing call to the West Coast distributor resulted in finding a special on a custom colour charcoal green Telecaster which my parents generously purchased for me. I immediately fell in love with the feel and sound of the instrument. Sometime earlier I had bought a Fender Super Reverb Amp but had nothing but trouble with its four 10-inch speakers so I soon replaced it with what proved to be a more powerful and durable Fender Twin Reverb. Pursuing my love of the sound of the pedal steel guitar I later bought a Bigsby kit made for the Tele and then put on a home made b-bender - a rather original design improvised from cup hook hinges and a welding rod. Soon after this I added an Echocord tape delay unit and a Fender tone/volume pedal. I also had been using a Gibson/Maestro Fuzz-Tone distortion pedal and a Vox Wah-Wah for quite sometime. The bite of the Tele was perfect for cutting through many of the outdoor shows and pub dates that Sue-On and I had started performing and gradually the Gretsches spent more time at home as the Fender took over. The Telecaster was also an excellent recording, TV and radio studio guitar and I used it exclusively on our first five albums and most of our TV shows. The original colour of the Tele is shown on the cover of our second album but after many years of road wear and outdoor shows it developed unsightly frost and heat cracks in the finish . . . and was badly chipped all over. So sometime in the mid-'70s I stripped it down to its natural wood colour. That's the way it appears on cover of Album Volume 12. The homemade b-bender bar attached to the head and running parallel to the neck is also visible in both photos. 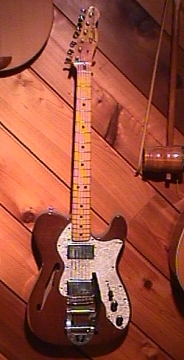 This Tele was a real workhorse and served us well until Sue-On presented me with a new Tele Thinline with Humbucker pickups on Xmas '75. This was to be the guitar we would use on our three tours of England and in our recording sessions in London, Newcastle and Durham. I had been a great fan of music from England since the '50s. Some of the first albums I had laboured over in my quest to unravel the mysteries of guitar were Lonnie Donegan recordings. In fact this was were I had learned my first blues riffs. Donegan was the leading exponent of British Skiffle music to which most of the musicians of the "British Invasion" period - including the Beatles - acknowledge as a major influence in getting them interested in playing in bands. Donegan had, in turn, developed his style by playing banjo in Chris Barber's trad (dixieland) jazz band through which he gradually spun off a solo career singing American black folk and blues songs. He pored over all the old American records he could find. adapting the material to his style, and soon found himself in the forefront of the Skiffle craze. While tracking down all the Lonnie Donegan records I could find, either in obscure record shops or through importing, I soon came in contact with records by Cliff Richard and the Shadows. My earliest influences then, included blues and folk via an English skiffle group, and guitar instrumentals via the backup band to England's Elvis. I was primed and ready then for the '60s invasion of the Beatles, Stones, Animals, et al. This in turn, led to a fascination with Vox amps and guitars as they always seemed present whenever these bands made TV or photo appearances. The first Vox purchase I made was a Wah Wah Pedal which I added to my chain of effects devices. My second experience with Vox followed soon after when I used a borrowed Vox amp for a teen dance at the Shilo Army base. I wasn't too impressed with this particular model as it overheated so much I was afraid it would blow up. It made me appreciate my trusty Fender Twin Reverb all the more. 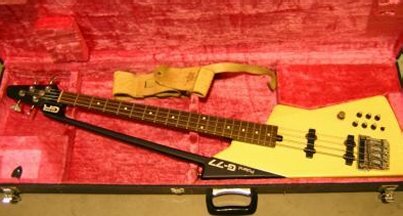 I was still intrigued with the very unusual Vox guitars, however. The Brandon Musical Store in downtown Brandon had always been a favourite place to visit. They sold guitars and amps and records: my first LP, ELVIS, came from there as well as my second amp, a Harmony. Sadly, all good things come to an end, and it was while perusing their stock during their sell-out sale that I came across a Vox electric 12-string complete with tremolo bar and string damper (mmm... why? on a 12-string). The fact that I had never played a 12 string made this red beauty all the more desirable . . . despite the fact that it was in one of their more conservative Strat-style shapes. Even though Sue-On and I were on a tight college student enforced budget, after reporting the finding of this must-have treasure to my beloved Nanny, she agreed that it was something I HAD to have in my steadily growing collection of guitars. Despite the predictions I had made that this instrument would be invaluable on stage, we found it of limited use in our trio. It played well but it proved to be too much of a hassle to take along and keep tuned for just a few featured numbers on the crowded pub stages. The Vox Tempest XII then, has remained a bit of a curiosity piece, and has spent most of its life hanging on the wall of our music studio, to be brought down for the occasional special occasion. Its last sojourn from the hook was when it guested on a few tracks of The Global Trucking Company's second CD. www.hillmanweb.com/guitars/g07.html Fender acoustic instruments have seldom impressed me. However, this palomino-coloured gem from Fender is one of the best looking, best playing and best sounding acoustic guitars that Fender ever made. In 1968, Sue-On and I moved to Brandon for three years to attend university. We lived with Sue-On's brother Kenny and his wife Rebecca, in a basement suite they had just completed in their west end home. To help pay tuition costs we played in Brandon pubs -- every night, from Monday through Saturday -- and were up every morning for 8:30 classes. The long hours of performing necessitated the constant learning of new material. Since we left our equipment set up in the downtown hotels or halls: Brandon Inn's Viking Room, The Cecil, The Beaubier, The Prince Edward, Brandon University, etc., we soon saw the need for having a good acoustic guitar for working on material before the shows. Enter the Fender Malibu, purchased second-hand, with case and pickup, for $100 from Keith Dodds, a Brandon musician. Actually, Keith now works for Leech Printing where we've had most of our album covers, inserts and promo pics done over the years. We've always preferred to have work like this done locally so that we have complete control over graphics design and production and their printing offices and plant are a stone's throw from our Brandon home. Sadly, our long relationship with this company soured when, during a house-cleaning binge, they threw out our entire two decade file of original artwork, family history books, design layouts, photos, and costly colour separations. The loss has left an irretrievable gap in the career bio that you are now reading. This Malibu model features a unique Fender pickup, but the type of stage work we did at the time, and the fact that we have always worked as a trio, made it difficult to work it into our stage sound. However, over half of the 50-odd original songs we've recorded were written on this guitar. I also used it for acoustic rhythm tracks on our recording sessions until I bought an Ovation Legend around the time of the Volume 6 album. For many of the songs I replaced the three bottom strings with treble strings for a Nashville HiBass tuning. The guitar and its case also have the dubious distinction of being pressed into drum service as we used them to pound out the backbeat on a few of our recorded songs. Up until our last album I've done all of the guitar tracks at our sessions. Usually, to get the right feel for what we wanted and to lead the rhythm section, I would sing a rough work track while playing a Tele. 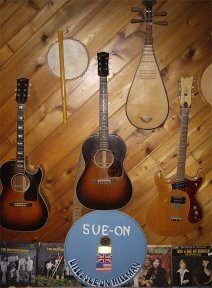 Once we had the bed tracks down -- Sue-On did nearly all of the drums and percussion on our sessions -- I would add a left normal acoustic track and then go back and add a hi-bass acoustic track to the right. The stereo effect from these different acoustic sounds sounded great in the control room, although by the time we had finished the mix the effect was usually buried beneath the other instruments. Oh, to re-record all of our original material using modern recording techniques ... sigh! www.hillmanweb.com/guitars/g08.html After my grandmother's death in 1971, Sue-On took over where Nannie had left off in trying to satisfy my addiction for guitars. On Christmas 1975, she surprised me with a new Telecaster Thinline. She had heard me admiring the fatter overdriving sounds that many of the current rock and blues artists were getting, so, with a little bit of help from the staff at Brandon's Ted Good Music store, she found one of the newer Fender Telecasters that featured humbucker pickups. The finish was dark woodgrain and it came with a maple fingerboard and a factory-installed Bigsby. All it was lacking was a B-bender, and with a little help from our former rhythm player, the very handy Jake Kroeger, we soon installed our patented rod bender and the shiny new Tele was ready for action. We had partial sponsorship from Canada's Traynor Amplifiers who had arranged for us to pick up our British 220-wired equipment at Wing Music in Kent. They also supplied a good Rodgers drum kit for Sue-On. but we couldn't find a Fender Rhodes or any other electronic piano. Our keyboardist, Kevin Pahl, had to make do with a Hohner Clavinet (and whatever keys that were available at each venue) and our keyboard bass for the entire tour. Luckily, our old friend Alan Jones, who had arranged much of the tour during one of his visits back home to England, was able to fill in on organ in some of the clubs which had a house organ. I carried this guitar all over the UK . . . wouldn’t let it out of my sight. I still have many memories of struggling with our 1 ½ year old son Ja-On strapped to my back, a suitcase in each hand, and the Tele case wedged under my arm, while pushing our way through the London Underground passageways and onto subway cars during rush hour. Needless to say, these odd foreigners with the strange Canuckian accents and bearing mountains of luggage weren't overly popular among the fellow commuters. As suggested by the photos in our photo galleries, this guitar proved to be a good all-around instrument. The late '70s and early '80s were probably our busiest and most prolific time. Sue-On and I were teaching high school and Kevin was working as a flying instructor, grain buyer and crop duster. But somehow we found time for a Grandstand tour of US State and County Fairs, three tours of Britain, outdoor country festivals, a tour of the North and Western Canada, tours of military bases, and a multitude of dance dates in rinks and halls. 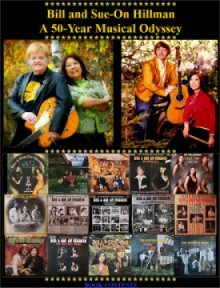 We also produced and recorded nine record albums and guested/produced many more for other performers, wrote and recorded 50 original songs, worked with most of the top country artists of the day, performed commercials, had a number of our own TV series, made and raised babies, performed on Canadian Country Music Association Awards presentations, appeared on Network TV and radio shows . . . and, in 1980, won the top award from the Manitoba Association of Country Artists: The Entertainers of the Year Award. Amps, PAs, musicians, costumes, songs, promoters, etc., came and went . 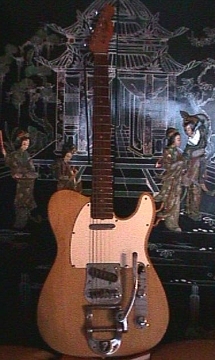 . . but the Thinline Tele was a constant . . . Bill and Sue-On . . . and Tele : ) Thanks ole buddy . . . and thanks Sue-On, ya give good Xmas gifts kid. After years of building b-benders and using Bigsbys, volume pedals and echo delay to eke out a few steel guitar sounds, it was only natural that someday I would pick up a real steel. 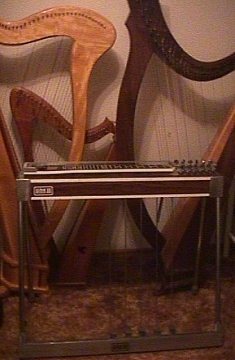 This steel was manufactured in Winnipeg by long-time steel player Wayne Link. I then got all the manuals, a few instruction tapes and struggled with the bar, pedals, knee levers, 12 strings and weird tunings in my attempt to learn a few tunes like Danny Boy. But since we were doing so much stage work . . . and since it is very hard to front and sing with a trio while playing steel . . . I gradually drifted back to my Tele imitations. About this time I had also bought a Fender Rhodes 88 electric piano to double on . . . and most stages just weren’t big enough for all of us. 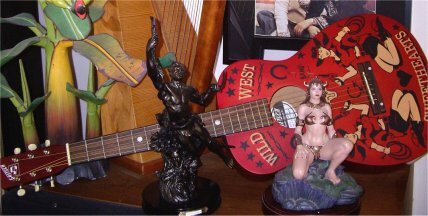 The other multi-stringed instruments in our photo galleries are our daughter China-Li's harps -- again, too many strings for a guy so used to six strings. In the mid-'70s we obtained an Ovation dealership and the sales people offered us a good introductory special on this Ovation Legend. In many ways it is a great guitar -- great tone and projection from its deep roundback . . . very elaborate abalone inlays . . . fine flat-top lines . . . a great molded case -- but over the years it has developed a few serious flaws. The electronics are controlled by only a volume control, with no control over tone. As a result the sound is often quite unusable without major exterior EQ adjustment. Possibly one reason this model was sold off so cheaply when we purchased it was that the wood wasn't properly cured. The truss rod in the neck, for many years, had to be adjusted with each change of season. In recent years the spruce top has developed a major crack down the middle from the bridge to the tail pin. Despite some of these flaws, we've used it as our main acoustic on many of our live shows, weddings, recording sessions, etc. It was featured prominently on the cover - and sound - of our Hillman Express ~ Track 15 ~ Vol. 6 album. Although we had almost always used electrics for our TV work, it seemed appropriate to press the Ovation into play for the 1980 CCMA Big Country Show at the Winnipeg Centennial Auditorium. We were asked to do two original songs and were backed by a full orchestra. We chose two of our singles recordings: the uptempo Cajun Stomp and our top ten release -- the duet ballad, One Night Stand. The concert was quite long and featured most of the top Canadian Country stars of the time. Appropriately, we were introduced by Nashville's George Hamilton IV, who was familiar with us through the reputation and trail of destruction we left along the English Workingman Club circuit in the '70s as he worked many of the same clubs. It was a good show for us as we were introduced as having just won the Manitoba Entertainers of the Year Award, the crowd seemed to be with us, and we got to rub shoulders with Canada’s top country performers on that one -- and the Ovation stayed in tune. The tape footage was broken into two separate shows that were shown many times on CBC network television -- shown everywhere but in our hometown Brandon, where the programmer at the local station opted to show a movie each time. The guys working at the station let us in to watch one of the shows off the network feed and we have a copy on Sony U-Matic 3/4" tape. The producer of the CBC show seemed impressed with our act and later called us to do a major country music gala in Toronto in conjunction with the Grey Cup festivities. Unfortunately, it was on short notice and we were already booked to play for a best friend's wedding that weekend. This and the demands from my day job, teaching high school, and caring for two-year-old Ja-On, made for a very difficult decision: we declined. The road not taken . . . . where would it have led? I ramble... but everytime I gaze at one of the members of my guitar family, certain thoughts seem to flood over me . . . these are just some of the memories that the Ovation brings back. Many more such tales shall surface in other parts of our Musical Odyssey pages. Hofner Memories During my first stint in college in the early '60s, my all-consuming major subject - Music & Guitar 101 - wasn't taught in any of the lecture rooms. True, I struggled through the History of Western Music, a Department of Music course taught by Lorne Watson. The main attraction here was the pass it provided to the great stereo listening rooms where we were to listen to famous operas and the great composers. Stereo records were a relatively new phenomenon then so night after night I would smuggle in all the stereo LPs I could afford to buy: Elvis, Frank Sinatra, Johnny Cash, Marty Robbins, Dave Brubeck, exotic percussion records, big bands, Nancy Wilson and other great girl jazz & blues singers, ... and anything that sounded good in stereo... even some of the required Classical records. Through the day much of my time would be spent in a room down the dorm hallway where one of my classmates, a HiFi Stereo buff, was eager to showcase his great sound system and his great reel-to-reel tape collection of the latest Broadway and Show tunes. After our daily TV noon show and the occasional class, my visits downtown would take me to the Strand Theatre for a matinee and a browze through all the record, music, magazine book and second-hand stores, sometimes followed by a visit to a Chinese restaurant to satisfy a craving for my recently discovered food obsession. A favourite music store was Johnson's Sound on Rosser Avenue. Albert Johnson was somewhat of a musical institution in the area. He had fronted a big band for many years, ran a dance hall - The Palladium - next to his shop, and had starred in one of the first live music shows on local television. In later years he designed and manufactured Johnson guitar amps and PA systems that he exported all over the world. I would often drop in and try out the guitars he had on display and he would often take time to share a few of the chords and riffs he knew on the instrument. The main line of guitars he sold were German imports: Hofners. One of the oddest of his stock of Hofner guitars was an electric bass, shaped like a violin. This bass wasn't a great seller... it hung there for years. Then, the Beatles hit and suddenly it vanished from the display window. I wish I had bought it. A fond memory I have of the Hofner "Beatle" bass involves Lenny Breau. I caught his act at the Establishment in Winnipeg one night. He played the Hofner all night - solo. Amazing sounds, innovation, technique and imagination! Fifteen years later. Beatlemania had come and gone -- and the popularity of the Hofner Beatle Bass had seen a sudden rise and fall. Friend, drummer and bass player, Kerry Morris and I were doing a lot of experimenting with a recording studio in the basement of our Maple Grove home and we realized that the sound needed the punch from a good bass. Sue-On and I had been Beatles fans from the start -- in fact, we had the thrill of playing in many of the North East England venues that the Silver Beetles had played in their early days -- and where many of the touring musicians we worked with still carried on the Hofner tradition. Fortunately, at about this time the monthly special from one of our music wholesale catalogues featured a Hofner fretless bass that the company had some trouble moving - catching dust in their warehouse - until now. Within a week I was soon the proud owner of a Beatle Bass. Sorry I didn't trust in your musical know how back then, Albert. You... and Paul McCartney . . . were ahead of your time. In the early '80s, Sue-On made the mistake of putting a set of guitar strings for an acoustic 12-string in my Xmas stocking one Christmas - bewildering as I did not own an acoustic 12-string. Our Christmases are always a major gift-sharing event and we always save our biggest and best surprise gifts for each other until after the stack of little ones under the tree are opened. The early stocking gift sort of took away from the surprise she had planned when it came time for the final extravaganza. She gave me a card that directed me to look under our bed for a surprise. Hidden there was a Yamaha guitar in a brown hardshell case. This proved to be a great guitar for many of the folk-influenced gigs we often were called upon to do. Always on the lookout for good duet harmony songs, our greatest influences were Ian and Sylvia, the Everly Brothers, Peter, Paul and Mary, and many of the traditional country and folk greats. And of course, a 12-string goes well with so much of this material. As with any of the Yamaha guitars I have tried, this model shows fine craftsmanship, plays well, sounds good, and has many more great features -- all for a very reasonable price. Up till now we had only ever had two experiences with Yamaha instruments: first, with one of their electric basses which Barry Forman our longtime bass/fiddle bandmate played for many years, and second, our Yamaha Baby Grand Piano which was, and is, a gorgeous instrument. In the mid-’80s I had traded video equipment for the earlier version of the Roland synth the G-303 -- from friend and fellow-musician Ken Storie... but soon after I traded in this system for the "new improved" 700 series. The G-303 is the only guitar I have ever traded or sold, but the cost of the new system (well over $4000) forced me to part with it as a down payment. 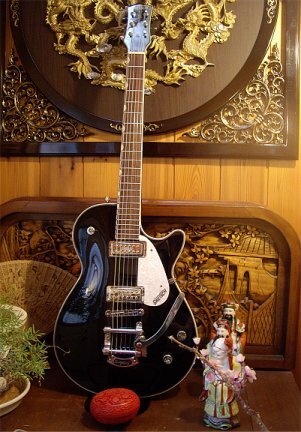 Before trading it in I removed the b-bender and Bigsby... and re-installed the Bigsby onto my Gretsch Country Club. Ever since this early experience with guitar synths I've had a fascination for them. I've put some of the info on the Roland systems into the following site which I hope will provide some reference for pickers sharing a similar interest. In the middle of a trading binge in the '80s I worked out a swap with local guitarist Doug Strange. I traded a Randall bass amp for a guitar which had fascinated me since my "Ventures days." Most by-ear guitar players who were trying to learn their craft in the early ‘60s were fans of this instrumental quartet. During my Brandon University years, starting in 1961, my noon hours were spent performing a live daily show on CKX-TV, my afternoons were spent at the Strand Theater catching the matinee and my evenings were devoted to jamming and rehearsing with one of the 3 or 4 bands I was playing with at that time . . . the grades were not great. One of the bands I worked with was managed by the owner of the Brandon Roller Rink who used to bring in some of the top artists of the day. We were employed as the house band for this huge rink located near the old Brandon Arena, which doubled as a show and dance venue. This was a good excuse to catch and rub shoulders with every act he brought in: Conway Twitty with Al Bruno on guitar, Elvis’s Memphis buddies Johnny and Dorsey Burnette, Chad Allan and the Reflections with Randy Bachman on guitar, the Fireballs . . . and the Ventures. One of my hobbies at that time was to collect behind-the-scenes anecdotes . . . and guitar picks from the performers . . . but the main reason for attending was to drool over the guitar licks displayed by the full-time professional lead guitar players. Meeting these California guitar greats and actually seeing them in action was one of the highlights of these early years. When I saw the Ventures in the early '60s they played Fenders. They had mentioned that the reason their Fender instruments weren't all featured on their first album cover - Walk Don't Run - was that they were touring when the photo was taken and the photo actually featured model stand-ins. A few years later, during their boom years, as part of an endorsement deal, they played Mosrite guitars exclusively. 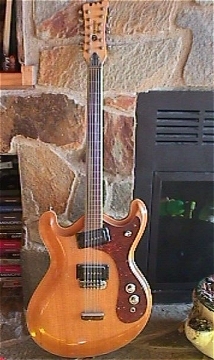 The unique shape of the Mosrite supposedly came about when the designers traced the outline of a turned-over Stratocaster. One of the previous owners of the the Mosrite I took possession of had strung the instrument with six strings . . . ordinarily not that unusual a procedure, but this model was actually a 12-string guitar. As with all Mosrites, the neck is incredibly thin and easy to play -- and the instrument has quite a distinctive sound. It has an alder body, featuring the "German carve" perfected by Mosrite founder Semie Moseley. The thin maple neck is topped with a 24.5" scale rosewood fretboard and Klusons tuners. It has an honoured place on my guitar wall. Since its official debut in early 1954 the Fender Stratocaster has proven to be one of the most successful, most influential and most cloned electric guitars ever manufactured. My blue Strat was another of Sue-On’s surprise Xmas gifts and it made our first Brandon Christmas away from our country home a memorable one. One of my first guitar heroes was Hank Marvin of England’s Shadows. I have always been intrigued by his red Strat, but since Sue-On knows that blue is my favourite colour, blue is what I got. Back in the fifties, I was introduced to many forms of American Blues in a very roundabout way. I became obsessed with the skiffle music of LonnieDonegan and set up many pipelines through which I could import his records (See our Lonnie Donegan Discography here). It was only later that I fully grasped the debt he owed to American Blues artists and that many of the guitar riffs I had learned from his records were actually this Brit's version of the blues. (Ten years later a whole new generation of guitarists would go through a similar experience when they would be introduced to the Blues by the Beatles, Stones, Animals, Cream, etc. - interestingly, most of the guitarists in these groups had been influenced by the music of Lonnie Donegan). I expanded upon these contacts I had made in England and was soon importing the records of Cliff Richard - England’s 'Elvis.' This led me into the world of the Shadows, Cliff’s backup group, featuring bespeckled Hank Marvin. Since there was a tremendous demand for instrumentals in the groups I worked with, the sounds created by Hank's Strat were soon being imitated by a red-haired, black-hornrimmed, Gretsch playing Canadian. It was to be thirty years before I could try out these songs on a Strat. My first experience with playing a Strat was not an auspicious one. We were booked for an arena dance at the Oak River Dance Gardens just after my Gretsch had just been stolen. I took along my Silvertone but my rhythm player offered to swap his Strat for the evening. Soon into the performance however, I realized that I was so used to the feel of the Gretsch with its saddle bridge and its well-positioned Bigsby lever that I could palm, that I just couldn't get used to the Strat. The whammy bar kept dropping out of reach and my combined picking/strumming technique constantly turned down the volume control by accident. I finished the evening playing trusty ole Sears Silvertone. As the years passed by, however, many more of the guitars players I admired, and often imitated, showed a preference for the Strat: Clapton, Mark Knopfler, Ventures, Vince Gill, Stevie Ray Vaughn, Robert Cray, Buddy Guy, Bonnie Raitt, etc. In fact, seldom do you see any sort of popular band that doesn't feature a Stratocaster or Gibson Les Paul. Thanks for the present, kid . . . it's a classic. Sue-On has always allowed, and even encouraged, me to indulge in what often turn out to be expensive pursuits in the name of music. Despite my appreciation of guitars, I made it almost into the 21st century without ever owning, or even playing, a Gibson instrument. Strange, as so many of my favourite players and so much of the music I've listened to are associated with Gibson guitars. So, when the opportunity came up to buy a Gibson acoustic from a one-time local jazz player who had retired from the music scene, my ever-supportive mate encouraged me to go through with the purchase. The guitar is in good shape, has good tone and is easy to play. I've never taken it on stage but I did use it in a TV documentary that the CBC did on us in 1996. They wanted to show us making music at home at Maple Grove before they taped one of our stage performances at Clear Lake resort. We sang a duet, while Sue-On played our Yamaha grand piano and I strummed on the Gibson. Ever since working with the Everly Brothers in the early '60s I have been a devoted fan of their harmonies . . . and their black Gibson guitars. Since buying a vintage Everly guitar was out of my price range, I recently did the next best thing a few years ago — I answered an add placed by a pensioner and former-jazz-player and bought his sunburst Gibson acoustic, but it really didn't look or feel much like an Everly. So, soon after this purchase I ordered a Yamaha black jumbo which looked much like an Everly Gibson -- sort of a poor man's Everly model. I have used this easy-to-amplify acoustic for most of our recent small gigs where we perform without the full band line-up. We have done a number of folk festivals and ethnic concerts in recent years where it has been a treat to work with our kids. First-born, Ja-On has played sax in rock bands and he has taught the instrument at a local music studio. Son, Robin, besides playing trombone in the Brandon University Jazz Band as well as drums and bass on many of our stage shows, also has a keen interest in Celtic music and looks forward to playing bodhran drums on our acoustic shows. Daughter China-Li, drawing from her Scottish roots, is an even more avid student of all things Celtic. Besides playing piano, synths, drums, guitar, trombone -- she is an excellent harpist and bagpipe player, and highland dancer. Her musical talents have been on hold in recent years as all of her energies have gone into obtaining an MD degree and then going on to specialize in Radiology. The booming sound of my Yamaha acoustic seems to fit in quite nicely with our Celtic explorations. In keeping with my appreciation of all things Chinese, as well as Celtic, I offset the shiny black finish of this flat-top by adding a white strap decorated with Asian characters. 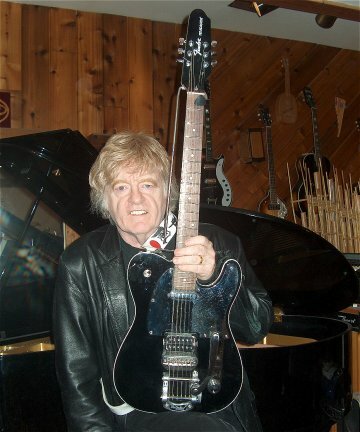 Interestingly, a guitar similar to this one was used by Randy Bachman, much of the time, on their re-union tours and TV specials. Not much to say about this guitar . . . it's proven to be a real workhorse. It spent some of its first years hanging on the wall behind the stage in our SOO'S Restaurant Showhall. We reserved this electric-acoustic for visiting musicians to use during our Saturday Night Jam Sessions. Since most guitarists/singers brought their own instruments, this guitar was only occasionally pressed into service. When I was recruited by Brandon University to teach in the Faculty Eduation as Assistant Professor I moved this guitar into my BU office. It proved to be a useful tool for putting variety into my classes . . . as well as for a few after-class jams with students. When I retired from University after a 40-year career as an educator, the guitar was passed on to our grandson, Soulin, who showed an interest in learning the instrument. This synth guitar, along with the companion GR-300 synth were added to my guitar armada in 2003. Both units had languished, unsold and forgotten - with original price stickers still displayed - in a Ted Good Music (Brandon) storage room since the 1980s. They looked lonely -- I brought them home with me. 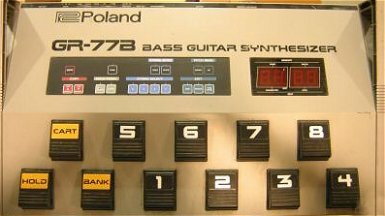 The early Roland synth guitars have a distinguished history. I feel fortunate to be the owner -- and player -- of three of these instruments. Much of the research I've done on the series is featured in the companion guitar pages I've created. I purchased this beaut in the summer of 2005. 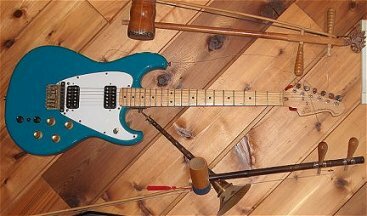 The Tele J5 signature model -- co-designed by guitar whiz John 5 -- was a "gotta have" instrument that I needed to round out my arsenal of Teles. The hot pickups, special features and very unusual headstock design piqued my interest as soon as I came across it in the new Fender catalogue. The price of the Fender Custom Shop model with Bigsby was prohibitive, however. My solution was to order the much more affordable Mexican-made model sans Bigsby and to install a designed-for-Tele Bigsby I had bought earlier on e-Bay. Unfortunately, this Bigsby kit was designed for the standard Tele pup layout, but with the help of friend Jim Ghidoni we did some drastic metal cutting in his hot rod custom shop and adapted stock Tele Bigsby plate to fit over the J-5 bridge pickups. While at it we installed my patented B-bender rod to the headstock. This is indeed a custom model - I've done modifications to this very expensive instrument that would make most guitar aficionados shudder : ) But it's a hot guitar and is fun to play and sees regular service at our weekly Cantina jam sessions. I've been a longtime fan of the Roland synth guitars, so when an old G-77 Bass system -- 1985 guitar controller and floor synth -- appeared for a great price on e-Bay, this +20-year-old vintage synthesizer system was a "must have." This seemed to make a lot of sense since I had only one bass -- a Hofner Beatle Bass -- and I was reluctant to take it on the road. Over the decades the various 3rd members of our trio often played bass: Barry Forman (Yamaha), Kevin Pahl (numerous keyboard basses), Kerry Morris (Fender), son Robin (Fender). . . and Sue-On, when not playing drums, played a series of keyboard basses (see below: Hohner, Fender, Moog, Roland). We've used the Roland Bass Synth numerous times without the synth floor module at our weekly Cantina jam sessions. It plays well. The limited-edition G4530 Wild West Sweethearts guitar is the first installment in the Gretsch Americana Series. 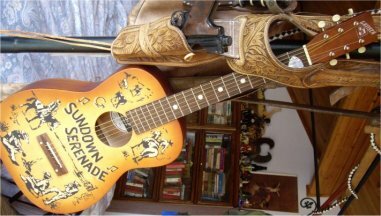 Reminiscent of the ol' cowboy guitars of yesteryear, this acoustic steel-string guitar features distinctive looks, original Western-inspired artwork, and playability. The short-scale length, 3/4-size design, durable real-wood construction and a precise factory setup make the Wild West Sweethearts a great portable acoustic - perfect for sing-alongs around the campfire. The Sweethearts travelled the wild west with us all the way down to their California High Desert Eden retreat near Joshua Tree and Yucca Valley during our 2012 visit with author Robin Maxwell and Max Thomas. We all visited nearby Pioneer Town, where so many Roy Rogers and Gene Autry films were made. . . it fit right in. I've had trouble identifying this model. It was purchased by Brandon University professor, Dr. Robert Brockway, in an American pawnshop/second hand store in the early '50s. It was pretty beat up at that time and was in even worse shape when I inherited it as a gift from Katy Brockway in my last year as a professor at BU. The finish on the back of the guitar was in poor condition but there were no cracks in the wood, the neck was straight, and it appeared to sound very good. I decided to invest some time and money into it to bring it back to playing condition. Other than to clean it up I didn't do anything with the finish, but I replaced the frets, the tuning keys, the bridge pegs and strings. It now sounds better than most acoustics I've played. The guitar has ladder bracing, binding on top and back, is about 14 1/2" wide, and there is no evidence of a serial number. There is a curious plate on the head with the name "GENE". Gretsch Americana Way Out West! December 2010, Bill and I made a deal to just order a pile of books and CDs from Amazon as our joint Christmas present to each other. The boxes arrived and sat under the most perfectly shaped and newly decorated Christmas tree. The boxes looked boring and held no real surprises, so what to do? As I have for many, many years since our marriage, I’ve always turned to Ted Good Music for inspiration: 12-string guitar (good for another story), a Telecaster, a Stratocaster, various effects pedals, guitar straps, etc. Bill had mentioned one evening a while back that he'd like to get a pick-up for his Gibson acoustic guitars one of the days. With that in mind, I slipped away one afternoon to the music store. The guys always smile when I go in - knowing this was my annual Christmas run. Scott showed me a very nice stand-alone pick-up: + $300.00. He went away to look for another model, slightly cheaper. While waiting, I saw this "very pretty”"black shiny guitar, saw a "SALE PRICE" tag and couldn't resist having a look. It was a Gretsch. Now, I don’t know much about guitars even though I've been surrounded by them for the last 45 years, but I do know the name stood for quality. I mean, I made Bill buy 3 Americana collection acoustic Gretsch guitars (for me) even though they had cowboys painted on them! After being assured as to the guitar's playability, and thinking that it was only $300.00 more than the pick-up, I knew this would be the best stocking stuffer for Bill! Scott threw in a Gretsch baseball cap autographed by Chet Atkins -- another perfect "stocking stuffer". I added the guitar case as well. These were to stay at the store until I could sneak them into the house. With our kids installed in the basement bedroom, it was the perfect place to hide the surprise. Christmas morning, after Santa filled the stockings, we woke up to see what he'd left behind. Bill was quite intrigued by the cap and wondered where I found it! Then one of the kids brought up the real surprise. Bill was quite speechless! It was well worth the extra money ;-) It seems I made a good choice and remain the perfect wife! My grandson, Soulin, comes over for guitar lessons, and my Fender Strat was always a favourite. That is, until I showed him a photo of a red SG in a rock book. "Wow! That's a cool guitar!" 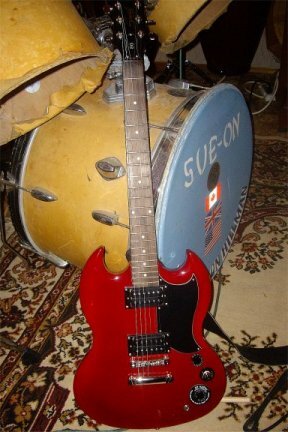 So, when a red SG appeared on eBay for a great price, we made a successful bid. The beaut arrived a month before Xmas . . . and then Santa got his hands on it. Not a bad starter guitar . . . a far cry from my Harmony Monteray of over 50 years ago. Yes, they are a bit weary and now rest most of the time in our home studio -- but are still road- and stage-worthy, and still follow Sue-On to gigs for which our son Robin, or other guest drummers aren't available. This Christmas guitar giving must stop! Sue-On did it again on Xmas 2011 . . . she even added a gutsy little 20 watt Fender Mustang I amp. Gibson Les Pauls have always evaded my grasp, but here's the next best thing - the Epiphone model. . . with Bigsby. It was a thrill to finally meet Les Paul -- the 91-year-old guitar and tech legend -- at his regular Monday night performance in this intimate Broadway club. We caught Les's reaction on camera when he learned I that I play a Fender Telecaster. Our table mate Nathan's young son had the foresight to bring a pick-guard from his Gibson Les Paul guitar which Les autographed for him. 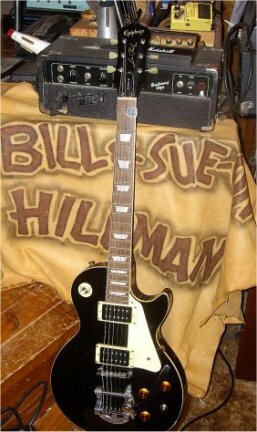 This was almost six years before I finally added this Les Paul guitar to my guitar wall. to see hundreds of photos, anecdotes, specs, links, articles, trivia, etc. 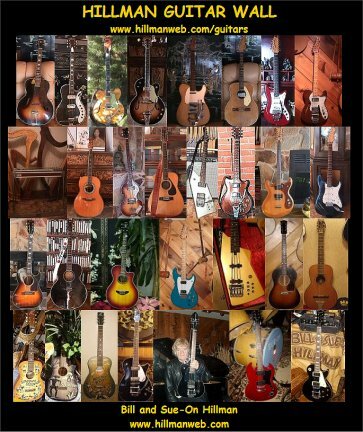 for each of these guitars.